Worried About Switching to ELDs? New regulations for electronic logging devices (ELDs) mandate the use of ELDs for records of duty status. If you currently need to log hours of service (HOS), you need to switch to ELDs. Whether your fleet is made up of delivery vans or heavy duty trucks, GoFleet has everything you need - at an affordable price - to meet compliance. We're the go-to source for everything you need to know about ELD Compliance. We provide affordable, industry leading ELD solutions to help you meet compliance with ease. Our fleet consultants and expert support team are here for you every step of the way. One Solution to Meet ALL Your Compliance Needs. It is essential to choose a partner that will grow with you when it comes to technology and staying compliant. By bringing together user friendly telematics solutions with in-cab mobile connected device choices we make it easy to stay ahead of potential issues. 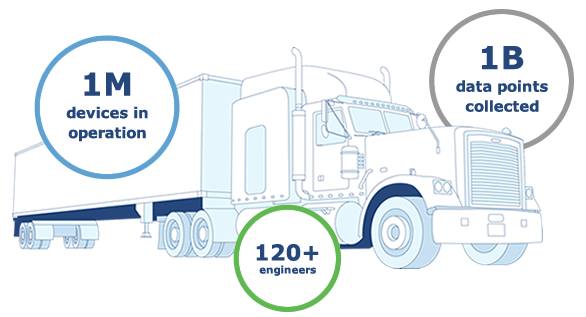 Since the late 1990's, Geotab has brought its innovation, expertise and open platform technology to businesses of all sizes — including Fortune 500 companies and North America’s largest fleets. With over 120 engineers on staff, nearly 1 million devices in operation and 1 billion points of data collected annually, Geotab consistently ranks among the top leaders in technology innovation. GoFleet has been partnered with Geotab for over 10 years; let us help you optimize your fleet, increase productivity, meet compliance and much more. The Federal Motor Carrier Safety Administration (FMCSA) defines an electronic logging device (ELD) as "Technology that automatically records a driver's driving time and other aspects of the hours-of-service (HOS) records." The ELD rule will "improve roadway safety by employing technology to strengthen commercial truck and bus drivers with hours-of-service regulations that prevent fatigue" according to the FMCSA. Will My Fleet Be Affected by the ELD Rule? Short and simple answer? Yes. An ELD or AOBRD (automatic on-board recording device) must be used by all affected motor carriers and drivers. ELDs MUST be used by all motor carriers and drivers subject to the rule. For more information, please visit the FMCSA's website. Ready to Get in Compliance? Geotab Drive is the Affordable Solution. Geotab Drive is an easy-to-use solution for Hours of Service (HOS) and Driver Vehicle Inspection Reporting (DVIR) compliant with the FMCSA. It syncs data between a tablet and our GPS device to provide various functions including violation alerts, automatic duty status changes, and a complete end-to-end inspection workflow. Plus, it's open and flexible platform allows for additional applications to be added to suit your specific needs. Get a comprehensive overview of fleet compliance and ELDs. Discover how Geotab Drive goes the extra mile to help your fleet meet ELD regulations without breaking the bank.